As Fifty-Fifty type Martini-like beverages go, this was all right. Sort of like adding a couple dashes of Angostura bitters to your regular Martini. My all time favorite cocktail with Hercules is still the Personality a la Roy, but this isn’t bad either. METHOD: Combine spices, peel, yerba mate and wine. Heat to 160 degrees. Filter through chinois and add Brandy. Let stand for at least a day. Pour liquid off of sediment and through a coffee filter and bottle. Forgot the peppermint tea from Hercules #5, because I am a moron. 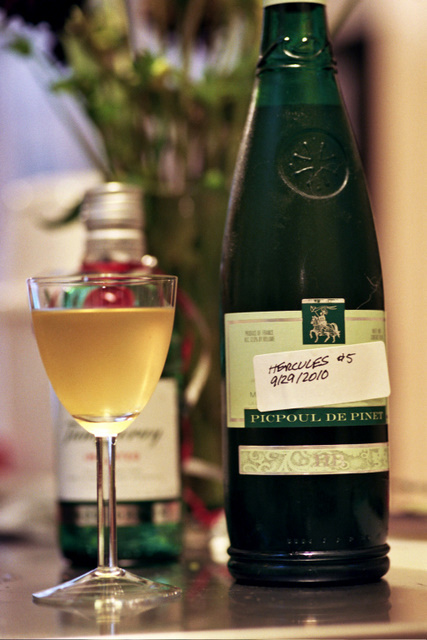 Reading about Vermouth production, discovered that one of the commonly used wines in France was Picpoul de Pinet. Happy coincidence when a local grocery store started carrying it. Well, sort of happy. I still prefer the Quady Essencia Orange Muscat for the base of Hercules. Any time I’ve used drier wines, the final product is less appealing.